If you resolved to become more physically fit in 2018, look no further our recreation centers. We offer hundreds of programs and classes throughout the year to help you improve your health and fitness. There’s a class for every age group and fitness level. Yoga, Zumba,Tai Chi, dance, aerobics, martial arts, kettle bell training and open gym for kids are just some of the activities you’ll find. Throughout the year, MPRB will be sharing opportunities for improving the health of our parks and the people who use them. Click the button below to browse health and fitness offerings for all ages. 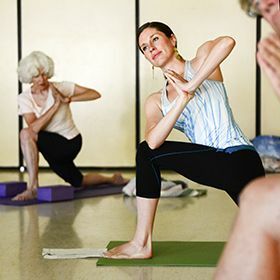 Enjoy yoga at nearby recreation centers.